Palutena's Temple as it appears in Smash. Palutena's Temple (エンジェランド, Angel Land) is a stage that appears in Super Smash Bros. for Wii U and Super Smash Bros. Ultimate from the Kid Icarus series. 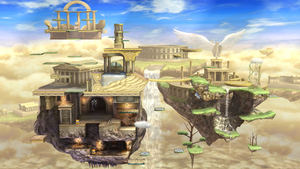 It depicts a stage from the original Kid Icarus with updated looks derived from Kid Icarus: Uprising. The stage was designed for 8-Player Smash, but is playable in normal Smash as well. This stage is where Dark Pit is fought for his unlocking battle in Super Smash Bros. for Wii U and where Palutena is fought for her unlocking battle in Ultimate. An overview of the stage in Super Smash Bros. for Wii U. The stage is similar to New Pork City in concept - it is primarily composed of a wide assortment of medium-sized platforms strewn around a very large playing field. The two upper areas have the largest terrain. A bridge connects these areas, which can be destroyed, except in 8-Player Smash. Above the bridge is a hazard in the form of a spike-studded platform suspended by a chain, which slowly moves left and right. In the top-left is a mini-stage that is very close to the top blast line. After enough time passes, it will go above the top blast line, dropping off any fighters on it. On the top-right part of the stage, when the platform floats to the top, three platforms appear for a while and then disappear when the platform is ready to float down. In the bottom-left zone are a couple of springs inside a cave reminiscent of the bottom area of Temple, with a spiked mace ball in the center of the area. On the left of this area, a ledge occasionally extends out of the wall, potentially boosting recovery. The bottom-right area is mostly blank space with several platforms, reminiscent of the Maze Sample Stage from Brawl. Pit is able to activate his Smash Taunt, Palutena's Guidance, on this stage, in both Smash 4 and Ultimate. When it is activated, several characters (primarily Pit and Palutena) will have a conversation about a random opponent, similarly to Snake's Codec Conversations on Shadow Moses Island. The Smash Taunt is not available on the Ω form. 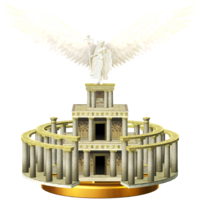 In Super Smash Bros. for Wii U, the Ω form is a stage with the design of the rising platform in front of Palutena's statue from the normal form albeit larger, set in front of the same statue. In Super Smash Bros. Ultimate, the Ω form and Battlefield form are similar to SSB4's Ω form; however, the main platform is resized and reshaped to match Final Destination and Battlefield, respectively. The three soft platforms of the Battlefield form are based on the yellow stone platforms in the normal form that are found more prominently in the upper left portion. Palutena's Temple, as seen in Kid Icarus: Uprising. Palutena's Temple Idol from Kid Icarus: Uprising. Palutena's Temple is where the goddess Palutena lives. In the original Kid Icarus, (under the title Palace in the Sky) Medusa usurped control of the palace and captured Palutena, prompting Pit to rescue her. In Kid Icarus: Uprising, however, this is also where she is fought as a boss. Here, she is possessed by the Chaos Kin, a chaotic entity that sought to create disaster by controlling the goddess and eventually eating her soul, which it nearly succeeded in doing. However, Pit was able to stop the creature with the assistance of Viridi and Phosphora. The boss battle was notably unique, as Pit had to avoid harming Palutena throughout the fight while focusing all of his attention on the Chaos Kin. Pit also had to fight hordes of his own former allies, the Centurions, in order to reach Palutena. It is also the location of the Capricorn Club, the tenth Zodiac Weapon. The stage is banned in tournaments primarily due to its extremely large size, which makes camping almost certain. Other factors include the stage hazards (spikes) and the walls and other objects which can create caves of life. It also takes a while for players to reach their opponents. The Palutena's Temple trophy is part of the Kid Icarus: Uprising Trophy Box. In the Kid Icarus series, Skyworld is where gods and angels live in harmony. Late in the story of Kid Icarus: Uprising, however, it falls apart, and the ruins of Palutena's Temple have become a stage to battle on. The bridge can be destroyed, splitting the stage in two, but you can still cross the gap using clouds or moving platforms. In the Kid Icarus series, Skyworld is where gods and angels live in harmony. Late in the story of Kid Icarus: Uprising, however, it falls apart, and the ruins of Palutena's Temple have become a stage in this game. The bridge can be destroyed, splitting the stage in two, but you can still cross the gap using clouds or moving platforms. A close up of the statue of Lady Palutena. Sonic hitting Pit with the Ore Club while fighting in Palutena's Temple. Villager and Link inside the lower left part of the stage. Robin with her Levin Sword as an item. Bayonetta teetering on the upper right hand corner cloud platform. Simon posing with his whip on the stage. Chrom taunting on the stage. Sonic and Knuckles the Echidna posing on the stage. With the exception of the song "Weyard" from Golden Sun: Dark Dawn, all music tracks on this stage are from Kid Icarus: Uprising. This is the most songs from a single game to be available on a single stage, at 9 tracks. In Super Smash Bros. 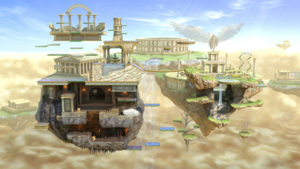 Ultimate, Palutena's Temple is the only stage where Spirit battles occur, yet none of them take place on the normal version of the stage. This page was last edited on April 16, 2019, at 08:36.